If I had to pick a word to describe Leonard Slatkin, it would be "professional". Always prepared and amicable towards his audiences, he rarely shocks or does things out of the ordinary. This puts him at the mercy of his orchestras in Detroit and Lyon, and of course the results have proven to be very uneven. Though he grew up in a profoundly musical household, this first installment of the Detroit Symphony Orchestra's Tchaikovsky Festival did not reveal any particular insight or secrets. The Detroit musicians played very well. I'm as tired of writing it as you are of reading it, but the orchestra features outstanding strings and winds and rather weak brass. When the brass do play out, it's generally not alluring. In an acoustic wonder like Orchestra Hall, this partially falls at the feet of the conductor, although as I've also written, nobody seems to be able to fix the issue, so I'm no longer blaming Slatkin alone. On this particular evening – exceptionally cold and bitterly windy – even the strings seemed to have some intonation issues, especially on the first half of the program. The woodwinds were able to cultivate a great sound for Russian music, and proved as excellent as always. For the most part, the brass did perform very well, although there were some predictably questionable moments. The Coronation March sounds just like you would want one to sound, with the obligatory "God Save the Tsar" blasting at the end. It's pure fun, and Slatkin and his ensemble played it that way. As for the Piano Concerto #2, the orchestra does very little except give the soloist a break here and there. 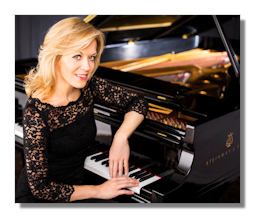 Slatkin managed to not overpower fan-favorite Olga Kern, and she managed to do whatever she felt like. I find the opening movement rather clunky, but the rest is full of poetry and charm. Overall, I probably prefer it to the more famous First Concerto. Kern was magnificent, though I suspect she'd sound better on something other than the Orchestra's in-house piano. I have solid relative pitch recognition; it comes off as hard-toned and a mite flat. After intermission came the "Pathétique". While Slatkin's personality isn't one to really dig in to this occasionally excessive music, I was happy with the huge amount of flexibility he permitted. At a hair over 13 minutes, the finale was slow without ever feeling like it was. The playing was also first-rate. If only there had been a touch more emotional heat. Other concerns included a somewhat heavy waltz; conversely, praise for a terrific third movement march. While this Tchaikovsky Festival may not give us the last word in heart-on-sleeve Romanticism, one can only hope it upholds the high-standard set here. Perhaps it's not the most revelatory or personal, but it does reflect the great professionalism and class that Leonard Slatkin has brought to Detroit.